I've seen cards like this before, but had no template. Using a Print Shop program I have, I inserted a round corner rectangle and re-sized accordingly....making each layer a little smaller than the last. 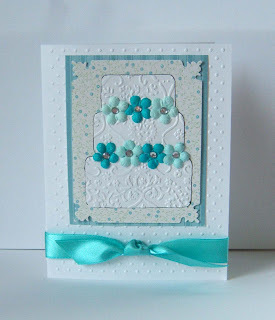 I embossed the cake to give it some texture and added a few flowers and rhinestones. I got to thinking that a chocolate cake would be yummy! 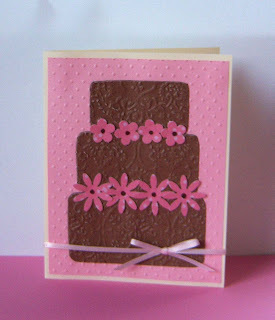 Here's a bigger version of the same cake - this time chocolate with pink flowers. I really like those anniversary cards! Very nice!